It was cold. It was sloppy. And, it was a show we’ve seen before on Opening Day, yesterday. But today’s another day, and the weather should be getting warmer. A quick report on the game last night and a look forward to tonight’s game, from #BaconUSA. Weather: It was cold. No, I mean really cold. I often say, add one more layer to how much you think you need to stay warm at the game. I was right–I headed back to the car to get that other layer in the third inning. Plus, I left my heated seat at home on the counter when dog-related drama distracted me on my way out the door. Joely Rodriguez: Wasn’t sharp. Nobody could really get a solid hit–but some found holes and he yielded some walks and his defense did him no favors. My read on his pitches is different from what I’ve read from the beats and heard from the radio guys. I’m probably wrong–I’ll hold off until I see him pitch again, but I’m hopeful for the 23-yo lefty. Blake Swihart: I don’t know. For all the hand-wringing of Boston fans and bloviating from the national media, he’s….OK. I need to see more. The dude’s an athlete though: he can get down the line nice and quickly–he did so to break up a double play and plate a run with such. Brian Johnson: Dan was reporting from the press box last night, and absolutely nailed it before the game: The lefty the Red Sox drafted with the compensatory pick after losing Jonathan Paplebon was really good. I’m not sure how Brian has time to be such a good pitcher with his responsibilities as AC/DC’s lead singer, though. Russ Canzler: Congratulations on the birth of his child! We hope Mom and Newborn are healthy and happy. Take your time, but, umm, we could use your right-handed bat as well, just about now. Pitch Clocks: Whatevs. Seems like they were mostly ignoring them, and seems like they don’t know how to work them from the box, just yet. I saw the pitcher step off twice, and the clock didn’t reset. I saw the clock spontaneously reset during the between innings shenanigans once. When they have to enforce them in May, the easy argument will be, “it wasn’t working right.” Then, that argument will waste way more time than the clocks saved in the first place. The between-innings clock shall now be referred to as the “pee clock.” I’m going to take my cue from the players and coaches and mostly ignore it. I’ll pay attention again when we get to May and the arguments and ejections begin (Brundage predicted it…). Tyler Henson: Was told that he needs to cut down on the K’s if he wants to get a chance at the next level. He got a good start last night: 2/3 with a BB and 0 K. I think I’d like to see him hitting 2nd (or 3rd), but he certainly did his job in that lead-off spot last night. Tickets: Widely available in all sections save the Pig Pen. Weather: Thunderstorms should be blowing through the area some time between 2:30PM and 5:30PM. Fear not, at first pitch, only 22% chance of precipitation and 63 degrees F. Should be nice and clear for fireworks! Did You Know? 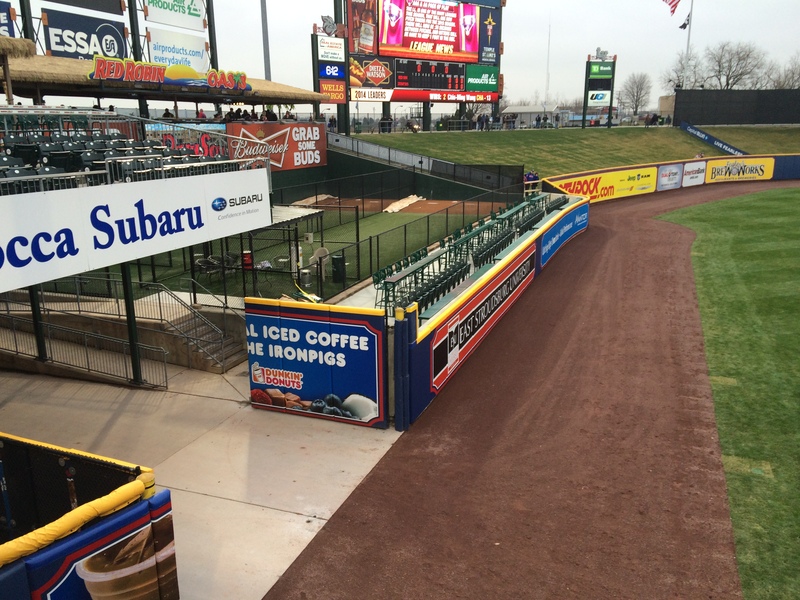 The average age of the 2015 IronPigs Opening Day roster is the second-lowest in our history? 2013 was the youngest squad. Hockey over at the arena tonight as well. The last-place and headed for the ECHL Norfolk team is in town for two in a row tonight and tomorrow. Tonight is the last Friday “Orange-Out” and the last free T-Shirt night. Tomorrow is concurrent baseball/hockey again, but this time the ‘Pigs start first with the 6:35PM Saturday start. Maikel Franco bobble cycle night at the ‘Pigs and Fan Appreciation Night at the Phantoms. Sunday concludes our “Sports Week” with a double-header: 1:35PM ‘Pigs game (magnet schedule, Adam Morgan start) and 4:00PM SteelHawks HOME OPENER! Full game-day details to come. Stay tuned right here on the Horn and Bell Blog! See you at the….soccer field? arena? ballpark?